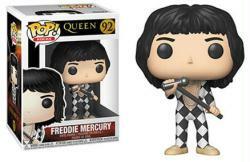 This is an approximately 4" Vinyl figure of Freddie Mercury of Queen from the Pop! Rocks line of vinyl figures. The figure was produced by Funko in 2018 and is numbered 92. The figure remains new and sealed in its original NEAR MINT packaging.